It’s the age of the young entrepreneur: In the past decade, more millennials are taking the path of entrepreneurship. With many young entrepreneurs hoping to become the next Mark Zuckerberg, almost 160,000 startups were launched every month in 2011, according to a report by the U.S. Chamber of Commerce Foundation. But an entrepreneur, especially a young one, needs more than just a great idea to get a business off the ground. Funding, mentorship, networking opportunities and a city’s affordability all play pivotal roles in the success of a new small business. 1. Access to funds. We looked at small business loans in each city — the dollar value of commercial and industrial, or C&I, loans under $250,000 lent per capita in 2013 by banks with less than $10 billion in total assets. 2. Networking and mentorship. For those just starting a business, the right environment — surrounded by successful business leaders — is key, so we included the number of businesses for 100 residents in a city’s metro area. To assess the availability of peers for networking, we included the percentage of residents in each city age 25 to 34 as well as the percentage of the population over 25 with at least a bachelor’s degree. 3. Local economy. We analyzed the local economy of the cities through its per capita income and unemployment rate. 4. Affordability. Minimizing costs is important when starting a business, so we included a cost-of-living index as a proxy for affordability. For those who are looking for tax, funding, legal and general advice on how to start a business, learn more with our Small Business Loan Guide. Capital area advantage. Arlington, Virginia, is the best city for young entrepreneurs with a high percentage of educated young people, the highest per capita income in the nation and access to businesses in the Washington, D.C., area. Midwest’s strength. Powered by a range of positive measures, Midwest cities — Madison, Wisconsin; Lincoln, Nebraska; and Minneapolis, Minnesota — earned spots on the list’s top five. California’s challenge. Despite being home to many of the biggest tech giants of the past decade, most California cities score poorly as places for young entrepreneurs. San Francisco is the state’s highest on the list at No. 23, and four of the bottom 10 cities are elsewhere in the state. The only West Coast cities in the top 20 are Seattle, Washington, and Portland, Oregon. Arlington earns the top spot thanks to its large young and well-educated population. Nearly 28% of the city’s residents are 25 to 34 years old, and at least 74% of all residents over 25 hold a bachelor’s degree or higher — both of these figures are the highest in the nation. The local economy is also quite robust, with a low unemployment rate and the highest per capita income of all places on our list. Female entrepreneurs connect at Arlington Women Entrepreneurs to network and collaborate with peers. Young entrepreneurs in Madison benefit from one of the highest per capita rates of small business loans — $799 per loan — in any major city. Living in Madison also is relatively affordable compared with other large cities, and the metro area’s unemployment rate of 3.4% is a strong sign of economic health. Early-stage entrepreneurs can find support at local resources such as gener8tor, an accelerator for startups. Lincoln boasts the highest per capita rate, at $819, of small business loans in all 83 cities in our study. Its cost of living and unemployment rate are also quite low compared to the national average, making it an affordable and economically healthy place for a young entrepreneur to launch a business. Minneapolis has a large population of residents age 25 to 34, who live in the Twin Cities’ business friendly environment — a place with a high number of businesses per 100 people, and a low unemployment rate. Minneapolis also ranked highly on NerdWallet’s list of the best cities for female entrepreneurs, with organizations such as Women Entrepreneurs of Minnesota offering a wealth of resources. The Greater Denver area, home of a number of small businesses, boasts a young population and low unemployment rate. The Jake Jabs Center for Entrepreneurship at the University of Colorado Denver is a local resource for aspiring entrepreneurs and those who need the support of a startup incubator. Not only is Seattle home to lots of young professionals (21.8% of residents are age 25 to 34), but the city is also one of the most educated places in the country — with nearly 50% of adults holding at least a bachelor’s degree. As an added bonus, this Pacific Northwest city has a per capita income that is much higher than the national average. Austin is increasingly becoming known as a hotbed for startups, especially tech companies. The city boasts a young, growing and well-educated population, as well as a low cost of living and unemployment rate. Austin also offers many local resources for budding entrepreneurs, such as the Small Business Development Program. Oklahoma City welcomes young entrepreneurs with a high rate of small business loans, an affordable lifestyle and a low unemployment rate. The city also has several small business incubators such as i2E, a not-for-profit corporation that supports early-stage technology businesses. Plano is home to a well-educated population, a high per capita income relative to its cost of living index and an unemployment rate that’s below the national average. Local entrepreneurs will find business training, workshops and consulting at the Collin Small Business Development Center, which is funded by the U.S. Small Business Administration, Texas and Collin College. Omaha is the most affordable city of the top 10 places on our list. The city also has a business friendly economy, which can be seen in its high rate of businesses per 100 people and in its low unemployment rate. Omaha also offers many local resources for young entrepreneurs, such as Straight Shot, a startup accelerator, and the Nebraska Business Development Center at the University of Nebraska at Omaha. Commercial and industrial, or C&I, loans under $250,000 per capita from banks with total assets under $10 billion from FDIC. Number of businesses per 100 residents in metropolitan areas from the U.S. Census Bureau’s Statistics of U.S. Businesses. Percentage of population age 25 to 34 from the 2013 U.S. Census Bureau American Community Survey. Percentage of the population age 25 and over with a bachelor’s degree or higher from the 2013 U.S. Census Bureau American Community Survey. Per capita income from the 2013 U.S. Census Bureau American Community Survey. September 2014 metropolitan area unemployment rate from the Bureau of Labor Statistics. Cost of Living Index from the Council for Community and Economic Research for the third quarter of 2013. All variables were weighted equally. We included 83 of the largest cities in the U.S. in the analysis. 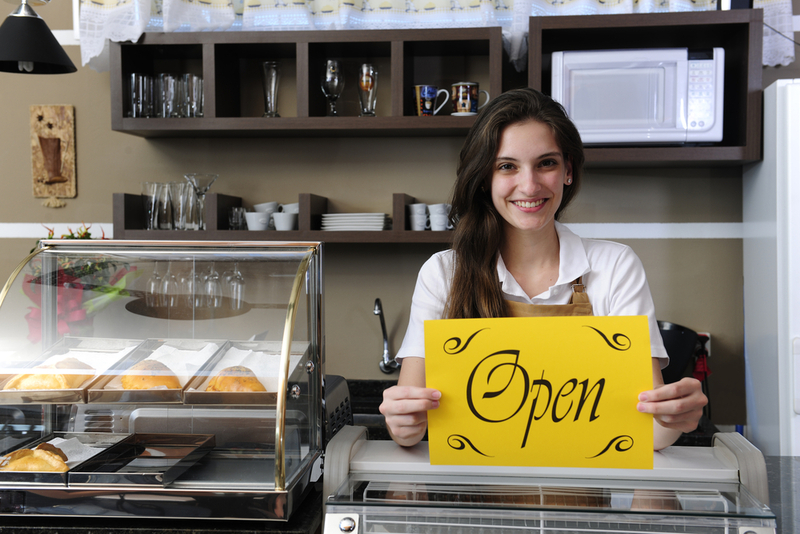 Young entrepreneur image via Shutterstock.